I have officially entered the last year of my 20's and have decided I must leave this decade with a BANG! So here is to a FANTASTIC year full of adventure! 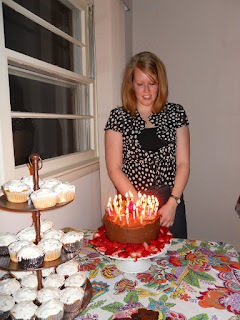 Chelsea's beautiful cake with my 29 candles blazing atop! Welcome back to the blogging scene! It's about time!!! ....just a series of adventures in the the life of a mighty redhead....including globe trotting, themed parties, exploring my creative side, eating good food with good friends....and much more. Bryan and Melissa: Oh Happy Day! Chelsea: Oh The Places You'll Go!